Leavers is a purely luxury fabric and is one of the highest forms of textile artistry and skill. These laces are proudly produced by true craftsmen in New England. Style 1454 in Black.Fancy Leavers floral pattern with feather edge galloon. 55% Nylon and 45% Rayon. Sold as a panel, 9" wide and 4 1/2 yards in length. 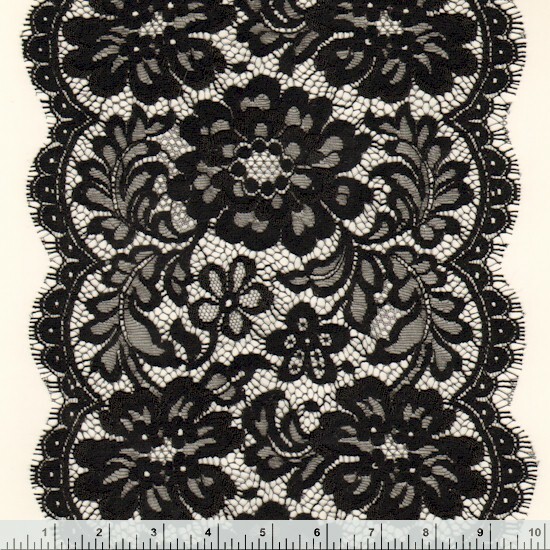 Minimum order 18 yards or 4 panels.